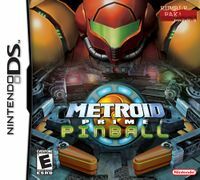 Metroid Prime Pinball is a pinball game for the Nintendo DS. It follows the same story as the original Metroid Prime, except in the form of pinball, although it does not feature Chozo Ruins. The game was developed by Fuse Games, and was released in 2005 in North America, 2006 in Japan, and 2007 in Europe. The game was bundled with an optional Rumble Pak, which fit in Slot 2 of the DS. Metroid Prime Pinball uses the basic mechanics of pinball, complete with an assortment of typical pinball items including flippers, spinners, bumpers, and ramps. In addition to this, it adds multiple new mechanics to the classic pinball formula that are unable to exist in real pinball, such as enemies that wander around the table, wall-jumping, the ability to fire weapons, and colored targets which can only be dropped by hitting them with balls of the same color. The touch screen can be used to "nudge" the pinball machine and alter the ball trajectory. The main game consists of six tables, all of which are based upon areas from Metroid Prime. The game begins with two tables available for play. The Pirate Frigate and Tallon Overworld tables serve as the main source of Chozo Artifacts, where they are awarded as prizes for completing objectives. Access to two more tables is granted upon activating all the objectives within either table. Completion of these objectives is not necessary to move on. In the next two tables, Phendrana Drifts and Phazon Mines, the player acquires a new ability on each table, along with battling a large boss creature. This boss is the source of one Chozo Artifact each (the first time the boss is defeated), and victory is required to move on to the next table. Completing any objective will earn an artifact unless the player has already acquired ten artifacts from completing objectives, in which case a special will be awarded instead of an artifact. A special is worth 50,000 points like an artifact but does not count toward the artifact total. Twelve artifacts are required to access the Artifact Temple. This table is unique in that the player is given a 6-ball multiball and losing all the balls does not detract from the player's extra balls. To complete this table, one must hit twelve different targets scattered throughout the table, while being bombarded from above by Meta-Ridley. If all of the balls are lost in any way, by draining off the table or being destroyed by Meta-Ridley, the table immediately ends. While a player will not lose any of the twelve artifacts he has collected, he will be forced to go back to a different table and complete it before being allowed another attempt at the Artifact Temple. Upon completing the Artifact Temple, access is granted to the final table, Impact Crater, where the final ability (Force Ball) is held. The only objective is defeating Metroid Prime. Once this objective is completed, the game starts again at greater difficulty, all the tables are available for single-table play, and expert mode is unlocked. The first two levels contain game modes you are able to activate through various methods. These include "Gunship Multiball," "Clone Multiball," "Phazon Multiball," "Parasite Purge," "Burrower Bash," "Shriekbat Shootout," "Beetle Blast," "Metroid Mania," "Phazon Frenzy," "Space Pirate Panic," "Triclops Terror," "Wall Jump," and "Hurry Up." The multiplayer option requires only one copy of the game and allows for up to 8 players to compete in a race to reach a target score. This mode uses a seventh table, Magmoor Caverns, that does not appear in the main game. In "Single Mode" you cannot move to other tables and cannot obtain artifacts. There is no explicit storyline in the game. However, events are loosely based on the plot of Metroid Prime on the Nintendo GameCube, where the object is to acquire 12 Chozo Artifacts, gain access to the Impact Crater, and defeat Metroid Prime in both its forms. Samus Aran herself serves as the ball in the pinball game, using the Morph Ball mode of her Power Suit. Multiball is available as two-ball Phazon-generated colored clones of Samus, along with up to three regular Samus clone balls. Samus can also unroll to biped form on the bottom screen, with the player rotating her left and right to aim her arm cannon at enemies. The game has received generally favorable reviews, holding a 79% at Metacritic and an 82% at Game Rankings. The game is considered by some fans to be the spiritual successor of Galactic Pinball for the Virtual Boy. This is because both are space-themed pinball games and both are Metroid themed (Samus appears in a mini-game on the Cosmic board of Galactic Pinball). The Space Pirate Frigate's background music is a remix of the original Brinstar's, whereas the "Parasite Purge" and "Triclops Terror" minigames have the music that goes with Hive Mecha, the second boss of the original Metroid Prime. This page was last edited on 4 March 2019, at 03:01. This page has been accessed 35,507 times.